Aert de Gelder was one of Rembrandt’s most faithful followers. This tender image shows the Holy Family resting as they fled Herod, the ruler of Galilee. 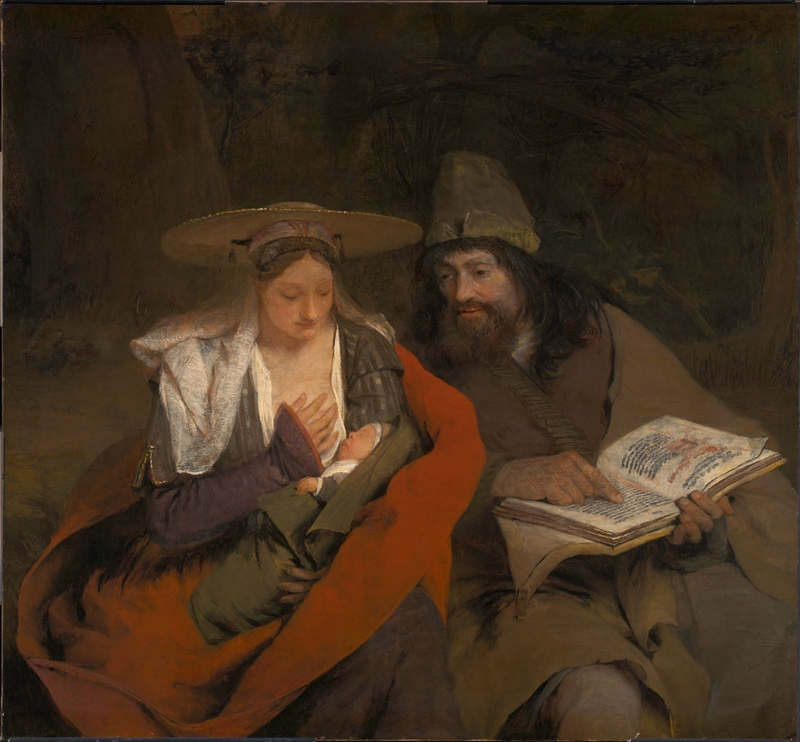 Joseph, looking toward the Christ Child, points to a book—perhaps the passage in the Old Testament foretelling the Messiah’s birth. The monochrome palette, chiaroscuro, and strong emotional psychology of the scene are elements De Gelder surely learned from his teacher. According to a letter from H. Gerson, Rijksbureau voor Kunsthistorische Documentatie, The Hague, to Angelica Rudenstine of the MFA (December 3, 1964), this painting may have belonged to the Plettenberg family as early as the 18th century. Ferdinand von Plettenberg, who died in 1737, is said to have acquired many pictures that were kept in the castle. The building and its contents were transferred to the Esterhàzy family when Maria von Plettenberg married Count von Esterhàzy in 1833. According to information provided by Horace Buttery at the time of the painting's acquisition, it was catalogued by the Esterhàzy family (no. 64); although this catalogue has not been identified, it may be the "Verzeichnis vermutlicher Autoren der Nordkirchener Bilder" of 1850. Nordkirchen Castle and its contents were sold by the Esterhàzy family to Engelbert van Arenberg in 1904. This painting was lent by the Duke of Arenberg, Nordkirchen, to the Kunsthistorische Ausstellung (Düsseldorf, 1904), cat. no. 303. By 1914 the painting was published as being with the Duke of Arenberg in Brussels (Karl Lilienfeld, Arent de Gelder: sein Leben und seine Kunst, 1914, p. 148, cat. no. 53).